Please join us from 10:00 AM to 11:00 AM today for the Free Community Workout. 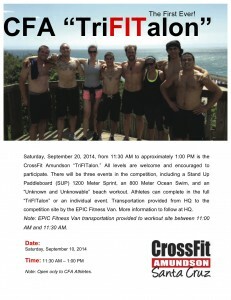 Following the community workout, CrossFit Amundson will be hosting the first ever “TriFITalon”. The Advanced Workout today will be cancelled to support this event. Please note the “TriFITalon” is only for members of CrossFit Amundson. Open gym will be from 1:00 PM to 3:00 PM with supervision from our Coaching Team. This is a great opportunity to work on skills and the accomplishment of your goals. We encourage everyone to participate in the “TriFITalon” and spend the day with us at the beach. Today from 11:30 AM – 1:00 PM is the official CrossFit Amundson “TriFITalon”! All levels are welcome and encouraged to participate. There will be three events in the competition, including a Stand Up Paddleboard (SUP) 1200 Meter Sprint, an 800 Meter Ocean Swim, and an “Unknown and Unknowable” beach workout. Athletes can complete in the full “TriFITathon” or an individual event. Transportation provided from HQ to the competition site by the EPIC Fitness Van. Full details on the flyer above.